After a false start yesterday, the Nokia E63 device that Womworld sent me can finally see proper light of day. Launched today Mobile Industry Review are one of the lucky few to receive the handset for a first hands-on. The E63 has a coloured plastic shell versus the E71’s metal one. The front is a metallic-finish, whilst the back cover is a soft-touch finish – both attract far few fingerprints than the E71’s. The E63 is nearly identical in dimensions to the E71 except for the depth – the E63 is around 1.5 times the depth of the E71. The E63 has a 3.5mm jack on top versus the E71’s 2.5mm jack on the side. This appears to be the first E-series to have a standard headphone socket – something normally saved for N-series. The E63 has no side buttons for volume or voice recording. It’s also missing the E71’s IR window. The E63 has a revised keyboard layout, adding a ‘/’ button on the lower row, shortening the space bar. The E63 appears to have a slightly smaller dimension screen although it is the same 320 by 240 pixels as the E71. The E63 lacks internal GPS. The E63 does not support HSDPA data. The E63 has the same 110 meg internal memory, but is shipped without an additional memory card (although a slot to add one is present). The E63 has a 2MP camera versus the E71’s 3.2MP and has a fixed focus. The E63 adds a flashlight function that allows the camera’s LED flash to be used as a torch. The E63 lacks the E71’s faux-leather slip case. And whilst it is clearly a cut-down model – I don’t find any of these differences make the E63 a bad device. The camera particularly is little sacrifice as the E71’s unit, regardless of resolution, was dire and the E63’s one appears no worse for its lower res. I’d even take the slight size increase and plastic case without too many complaints – in use a smudged and smeary E71 doesn’t look that much better than the E63. …and now all of these things can be obtained from Nokia without also incurring the cost of high-end cases and GPS. The executives may still have the E71s but the rest of us will get the E63s… Looking at the popularity of the lower-spec Blackberry devices around the large corporates I know (where they’re deployed in the hundreds or thousands) this is a smart move. I’ll be testing the device out over the next few days and we’ll have it on the show early next week. As ever – post your questions below and I’ll do my best to answer them. Update: It will be available in blue as well as the red pictured above for Ã¢â€šÂ¬199 pre-tax SIM-free (which will typically equate to £199 in the UK once taxes are included). Full press release here. Hopefully they can get it in at AT&T, and they could sell it sub $50 with operator subsidy! Maybe we'll finally get some market share in the states? e63 hs fb application ???……….. A good tool, balanced for personal and buiness use with good comms optiions, entertainment and reference functions, in a sporty yet serious, well -perfoming package. And at least in the US, for those who don't go with tthe pack. 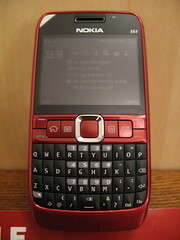 Wow, Nokia’s E63 is an interesting low-budget alternative to the E71. http://is.gd/78dN Only needs a better browser + 5mpx cam + flash.